HIGHLY RECOMMENDED: Moobuzz 2011 Pinot Noir, Monterey. 13.9% ABV. $16/suggested retail. 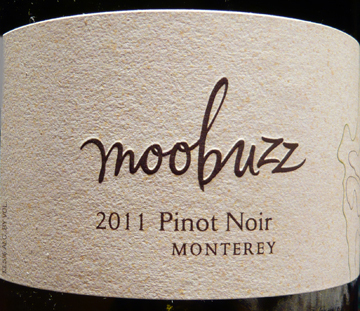 Back in November, I reviewed the 2009 Moobuzz Pinot Noir and recommended it: http://www.thefrugalwinesnob.com/?p=700. This week, I found something even better: the 2011 Moobuzz, released in May 2012. This wine is SPECTACULAR and is the best Pinot Noir I’ve tasted so far this year. Lighter in color than any Pinot Noir I’ve encountered yet deeper in hue than a rosé, it has perhaps the most beautiful clear ruby color I’ve ever seen in any wine anywhere. That, and the fact that it has been released so young, tells me that it was might have been treated in part as a rosé during its fermentation, spending less time in the skins than darker, heavier Pinot Noirs. It would also explain the extraordinarily smooth and classy texture. And, as it turns out, it’s an intriguing blend: 86% Pinot Noir, 10% Sangiovese, 3% Tempranillo, and 1% Syrah, with 86% of the grapes hailing from Monterey, 10% from Mendocino, and 4% from Lodi. 5,400 cases were produced. It is incredibly aromatic and delicious. Strawberries, a bit of spice, a thread of cedar, a little cola, a hint of good French perfume—the nose is just marvelous and I almost wanted to sniff it more than taste it. Like the 2009, the 2011 is perfectly balanced, with nothing upstaging anything else and yet the package as a whole delivering an oddly powerful package of sheer deliciousness and a long, gentle finish. Cherry, caramel, strawberry, a kiss of French oak, chocolate, coffee, a hint of something exotic like truffles. I liked the 2009 very much, but fell in love with the 2011. I sniffed and sipped this one unchilled, by the way. LABEL NOTES: Whimsically elegant, poetic and deliciously seductive, Moobuzz captures the very soul of the coastal California. WEB: www.TOGwines.com. For more information about the winemakers, please consult the older review: http://www.thefrugalwinesnob.com/?p=700.